This video explains how to create a basic skeleton for an object in Maya. When you create a skeleton, it is made up of bones and joints as shown below. The skeleton can be placed inside an object and you can then bind to skin (bind the skeleton to the object). Watch the video below to find out how to set up a basic skeleton and attach it to an object (bind to skin). 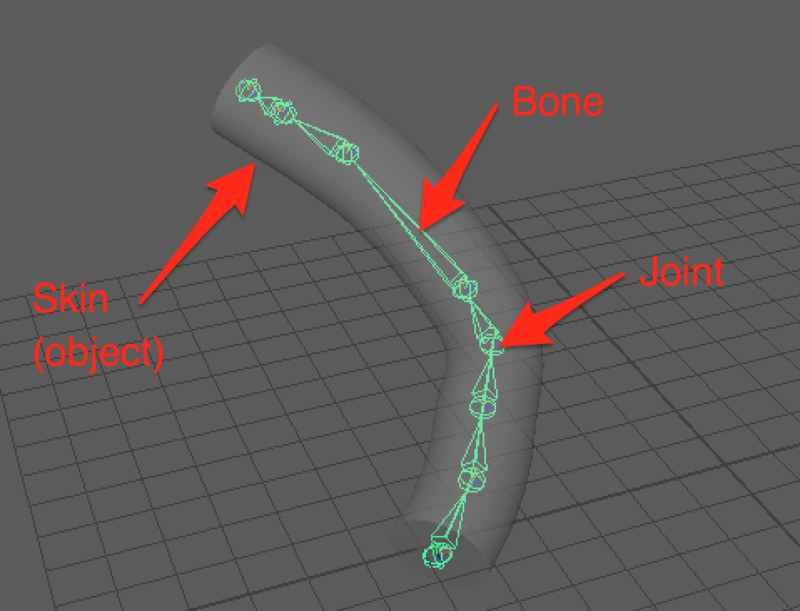 This video explains how to animate an object’s skeleton to a motion path in Maya. 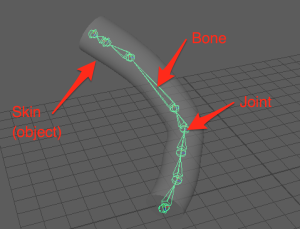 When you animate a object with its skeleton attached to a motion path, the object can bend along the curve. This is useful if you are trying to animate the movement of something like a fish or a snake. An object with its skeleton attached to a motion path. 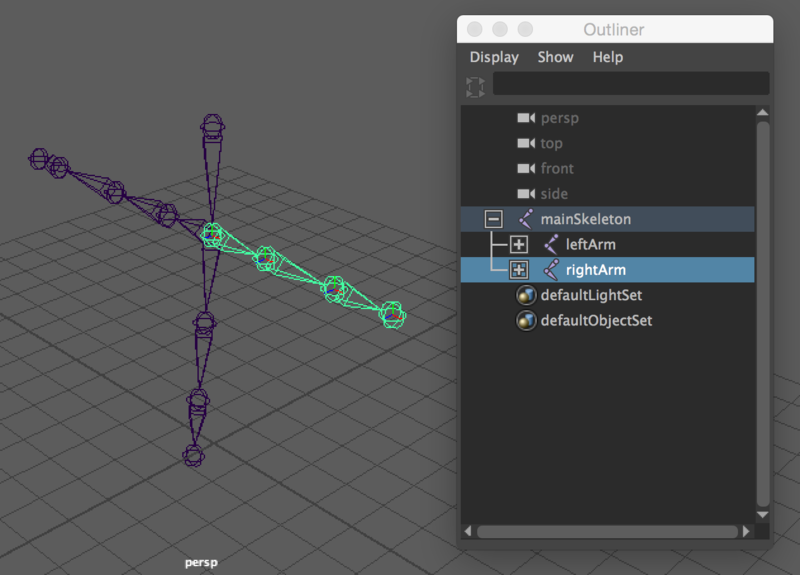 Watch the video to find out how to animate a skeleton to a motion path. Note: It is important to follow the step where you rotate the object so that it is facing straight towards you when viewing from the right-side view. If you don’t do this then the motion path animation will be a bit buggy. It is also important to remember to click on Modify and Centre Pivot before attaching the object to the motion path. This video explains how to animate changes in the material or colour of an object, how to animate lights and also how to animate cameras. This video explains how to bend a curve, move parts of a curve, add points to a curve, and extend a curve. This video explains how to add text to a scene and then animate it in Maya. You can manipulate text in the same way you manipulate many other 3D objects in Maya – you can move (translate), rotate, scale, set keyframes or even animate along a path. Watch the video below to find out how to create and animate 3D text in Maya. 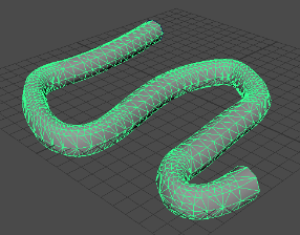 This video explains how to extrude a circle along a curve and then animate an extrusion. 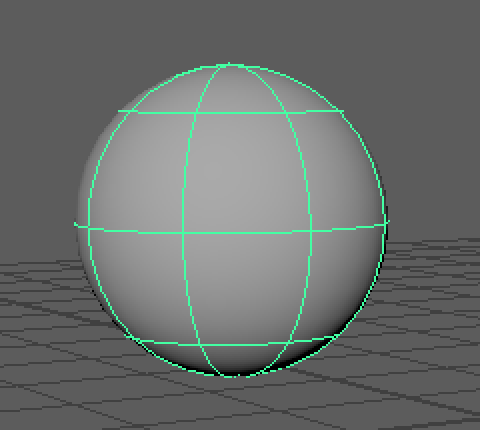 When we ‘extrude’ a 2D shape such as a circle, it means that we will push that shape out. By using a curved line, we can push the shape out so that it follows the line. Watch the video below to see how to do this in Maya. Tip: When selecting the circle and CV curve, select the circle first and then hold down Shift key to select the CV curve. Make sure you select the curve last. Watch the video below to find out how to animate an object along a path. This tutorial explains how to use lights in Maya and also how to emit light from an object such as the Sun or a light bulb (so that it glows). Please note that this video is a basic overview to get you started with some of the many lights and lighting effects you can use in Maya. You can also download printed instructions here. You can download the instructions from here if you would like light in your project to lose its intensity or reach over a distance. 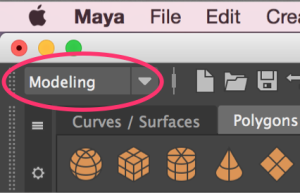 In this tutorial, you will learn how to use boolean modeling in Maya to take an object and subtract, add or intersect the geometry of the object with another object. 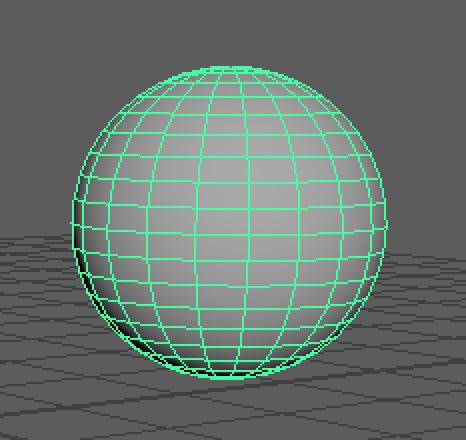 Union – this will merge both selected objects together and will remove any geometry between the two objects. The two objects will essentially become one object. Difference – this will ‘subtract’ or take away the last selected object from the first selected object. What this means is that one object will be used to “take a bite out” of another object. Intersection – this will keep the geometry between the two objects and remove the rest. To access the boolean modeling tools, make sure the Modeling menu set is being used first. Now select both objects and click on Mesh > Booleans. You will be able to choose from the Union, Difference, and Intersection boolean operations. Watch the video below to see how to use these boolean modeling tools. This video tutorial explains how to add cameras in Maya to change the view of objects and also how to render a scene as individual images or as a movie. This tutorial video explains how to animate a shape in Maya using keyframe animation on the timeline. Tip: To change the frame rate (frames per second) of your animation go to Maya > Preferences > Settings. Under ‘Working units‘, you can change the frame rate in the drop-down box next to Time. The default frame rate is Film (24fps). This video tutorial explains how to manipulate individual components (or faces) of a 3D shape using the component view. This tutorial explains how to create 3D objects and how to move, rotate, and scale 3D objects you have made. You will also find out how to see your objects in different views (perspective and orthographic), how to see your objects as wireframe or shaded, and how to view all the information about an object. A polygon is made up of faces put together. Each face is flat. Watch the video below to see how to create NURBs and polygons, and how to manipulate these 3D objects.